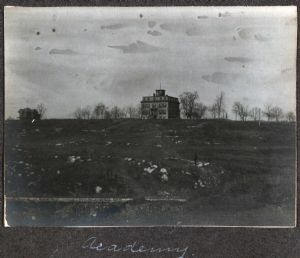 Arthur Dornblaser's photograph album labeled this as "Academy". It was also called the Male High School. The photograph would have been taken from South Walnut Street, looking up the hill. George C. Pearson was listed in the 1893 City Directory as the principal, Male High School. Jacob Chrissinger, a laborer and William Chrissinger, a coach maker, both listed their residence as Male High school. The building was later purchased by the Western Maryland Railway and used as offices. The rail junction nearby was known as Academy Junction. See also Male High School, Hagerstown: An Illustrated Description, 1887.